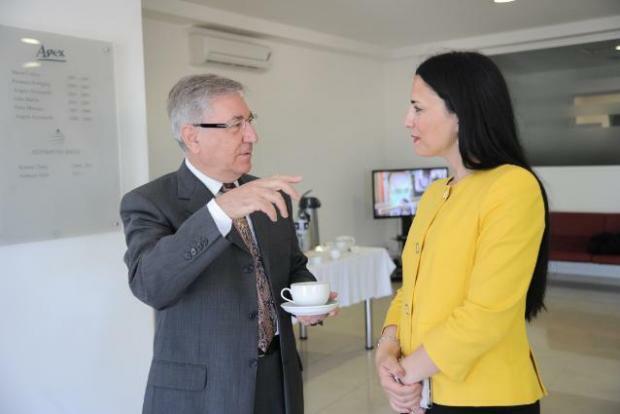 Andreina Fenech Farrugia with EU Commissioner Karmenu Vella. The director of Malta’s fisheries department has been suspended following allegations that she demanded money off a Spanish tuna kingpin. Andreina Fenech Farrugia was asked to step aside after phone intercepts published by Spanish news outlet El Confidencial suggested she was involved in a tuna corruption racket. A top government source told Times of Malta that a new department director is expected to be appointed later on Tuesday. The decision was later confirmed by Environment Minister Jose Herrera. In transcripts of telephone conversations between Andreina Fenech Farrugia and Jose Fuentes Garcia, published by El Confidencial, the Maltese fisheries boss tells Mr Fuentes “I am in Bulgaria just for you. You have to pay me, because I have a meeting with the [director] general of Brussels”. The documents date that conversation as having taken place on June 20, 2018, when EU fisheries heads were meeting under the auspices of Bulgaria’s EU Council presidency. Dr Fenech Farrugia categorically denied the allegations, saying in a statement that "I have always observed and employed the highest standards of diligence and professionalism in my work". "I always took the necessary legal steps against all operators, at all times, when any illegalities were detected," she added. Investigators are working to the theory that Malta helped the Fuentes Group import undeclared tuna into Spain, bypassing quota restrictions. Authorities suspect that the illegal trade reached up to €25 million. Mr Fuentes sits at the top of a multinational empire which covers more than 40 different companies. Tuna, however, is the family crown jewel, and the Grupo Fuentes is the world’s largest seller of Atlantic bluefin tuna. The company has a Maltese subsidiary firm, Mare Blu Fishing. According to Mare Blu’s audited accounts, the tuna ranching company made a €7.5 million loss in 2017 – with a gross profit of €26 million wiped out by other costs. Mare Blu is the only local tuna farming operator to not form part of the local fish farming lobby. In a statement, the lobby - the Federation of Maltese Aquaculture Producers - welcomed Dr Fenech Farrugia's suspension. "We need to ensure that the industry's reputation is safeguarded," FMAP CEO Charlon Gouder said. In a statement, the government said it was collaborating with the authorities in all ongoing investigations to establish all the facts of the case, even in the best interest of the fisheries and aquaculture sector. The Maltese police, it said, had involved Europol to receive information from Spain. Meanwhile other investigations by the Malta police were continuing and an inquiry led by Magistrate Gabriella Vella was ongoing. Last October, The Sunday Times of Malta had reported that Spanish and Maltese authorities were untangling a web of shell companies and distributors used to funnel illegal tuna catchers from Malta-based tuna farms to Spanish tapas bars and fish markets. Sources had described the operation, codenamed Tarantella, as the largest-ever crackdown on illegal tuna trading in EU history. At the time, they had hinted that a senior official at Malta’s fisheries department could have been facilitating the process. Suspicions had first been roused after a tuna company’s request to increase its export quota by 33 per cent had been waved through by the department without the necessary checks. It was only halted “at ministerial level”, the sources had said. Spanish authorities had arrested 79 people across six different regions last June, and their investigations had led them to Malta. El Confidencial’s sources were not very complimentary about Malta. “Activists, high-ranking officials and entrepreneurs in the sector have long described the archipelago as a good place to launder tuna,” the news outlet wrote. “These investigations are lending credence to those rumours”. This is the second time Dr Fenech Farrugia has been booted from the top fisheries position. She was first removed from the post in 2011, after EU fisheries officials warned that administrative shortcomings could spell the end for Malta’s fisheries sector. Dr Fenech Farrugia was instead given a plum post within the Competition and Consumer Affairs Authority, where she served as director of enforcement, according to a 2012 government press release. But just two years later, weeks after Labour assumed power, she was reinstalled in the top fisheries department job. That decision had caught several stakeholders by surprise, Times of Malta had reported back in 2013. Speaking later on Tuesday, Nationalist Party MP Jason Azzopardi alluded to her first sacking, asking why the Labour administration had reinstated her. Dr Fenech Farrugia's suspension was positive, he said, but it begged the question why other officials had not been treated similarly. "It's impossible not to compare her to the corrupt Keith Schembri and the corrupt Konrad Mizzi," he said, referring to the two top officials caught with offshore companies. "The Panama Papers went far beyond allegations. Joseph Muscat is applying two weights and two measures". As director general of the fisheries department, Dr Fenech Farrugia also led the fisheries board, which is tasked with advising the minister on the sector. She also serves on the board of Malta Marittima, a government agency created in 2016 to bring fishing sector stakeholders together. In March 2015 she was made Deputy Chairperson of the Administrative Board of the European Fisheries Control Agency (EFCA). One year later, the French government made her a Chevalier of the National Maritime Order by the President of France.